Decision: When should you play Aggressive Defence? Aggressive Defence provides great benefit to warbands that have high wound counts, low defense stats, and aggressive attacks *cough* MagoresOrksAndMaybeDwarves *cough. * If you're playing My Turn, consider playing Aggressive Defence too. If you do include it, try to play it when it alters the potential outcomes of the incoming attack the least, when it protects you from being driven back, and/or when it is likely to result in a devastating counterattack from your fighter. Gambit slots in Shadespire are at a premium. There are so many excellent universal ploys, it's hard to find cards that fit into the magical "maybe" space that we have addressed in previous articles - cards that aren't auto-include but also aren't trash. Therefore, we've altered the primary question slightly to address Aggressive Defense. We will be considering whether or not to include it in decks at all, but we'll also be looking at the ideal situations in which to play it if you've already decided it has a spot in your deck. It's likely we'll be continuing with this format in the future. In order for Aggressive Defence to be useful, your fighter has to survive the initial attack. In essence, there are two ways for a defender to survive an attack (though there are nuances to each): 1) don't get hit or 2) have enough wounds to live if the attack does hit. The use of Aggressive Defence drastically reduces your chances of #1 (more on that later) so for now, we'll focus on #2. Warbands with fewer models tend to have higher wound counts on each model, and are therefore more naturally suited to playing Aggressive Defence. 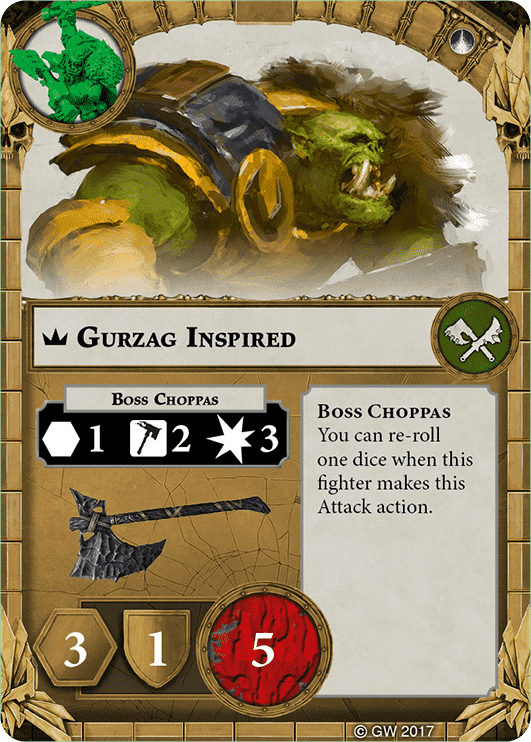 This is not to say that Zarbag's Gitz, who have no models with more than 3 wounds, can't play this ploy effectively, but that it takes a great deal more planning in order to do so. In general, 3- and 4-model warbands will get more use from Aggressive Defence than those with 5+ models. Mathematically, Aggressive Defence alters the odds of being hit in a fairly predictable manner. Essentially, the roll goes from being contested (with the odds of success being outlined here) to being a check against raw accuracy (odds of success found in the chart here). In many cases, the difference made by forgoing a defense roll is minor. For example, if a 2-sword attack is aimed at a a 1-dodge defense, it succeeds around 44% of the time. If the same attack is aimed at a fighter who has used Aggressive Defence, the success rate only improves by 11.5%. Put another way: in this situation, Aggressive Defence will only change the outcome of the attack 1 in every 9 times. Similarly, against attacks that already decrease your ability to block (such as those with cleave) Aggressive Defense provides a counterattack at a low cost; your defense roll is already unlikely to succeed, so playing the ploy changes very little. The relative risk of playing Aggressive Defence increases as attacks become more accurate and as defenses become more likely to succeed. Using Aggressive Defence on a model that has a 2-shield defense stat is much riskier than using it on one that has 1-dodge. If we take the same attack as above (2-swords) and place it against a 2-shield defense, it only succeeds 30% of the time. In this situation, if we play Aggressive Defence we actually increase the attack's odds of hitting by 25% - meaning that it changes the outcome of the attack 1 in every 4 times, as opposed to the 1 in 9 seen above. This same neat progression cannot be seen when we talk about increasing the accuracy of the initial attack. High accuracy attacks are likely to hit anyway, so playing Aggressive Defence does less to alter the outcome. Initially, this may sound like we are saying that high accuracy attacks represent an ideal time to play Aggressive Defence; in a sense, that's true, but you have to remember that the attack is likely going to hit, so make sure that you can soak the wounds it will dish out. Finally, it should be noted that Aggressive Defence only allows you to counterattack the model that initially attacked yours - so don't count on playing it against attacks with greater range than your own. Conversely, models with range 2+ attacks are more likely to be able to make effective use of the card. Factor: Immunity to "Driven Back"
One benefit that is likely to be overlooked when considering Aggressive Defence is the immunity it grants to being driven back. This immunity affects decision making in several ways. First, immunity to drive-back allows you to avoid certain triggered effects such as those on Shake About or Pit Trap. In addition to allowing you to avoid damage caused by lethal hexes due to being driven back into them, Aggressive Defence can limit the amount of extra damage your opponent can stack onto a single attack. With both Trap and Pit Trap eliminated, the only surprise damage increase your opponent is likely going to be able to conjure is Twist the Knife. Thus, you can feel safe letting your undamaged Riptooth soak a 1 damage attack - something that can't readily be said in situations where he could be driven back. 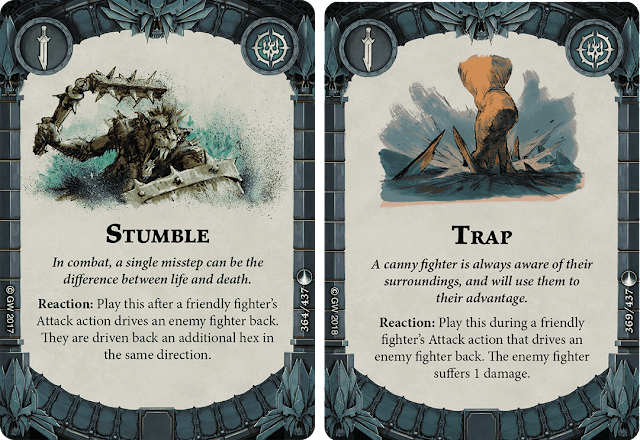 Another way in which the immunity to being driven back might affect decision making during the oft-overlooked situation in which your fighter is trapped (not Trap-ed). A trapped fighter gets hit on ties, drastically increasing the chance that they will be damaged by an incoming attack. For example, a 2-axe attack succeeds 54% of the time against a 1-block defense. However, the chance of succeeding increases to 68% if the defending fighter is trapped. If you play Aggressive Defence in this situation, the probability of being hit only increases by a paltry 7%! As such, trapped fighters represent ideal targets for this action. So far, we really haven't examined the whole reason that we play Aggressive Defence - the ability to counterattack your enemy. That is, perhaps, because this consideration should be the most obvious. If we use a ploy to gain an extra attack, we want that attack to be meaningful. Thus, models with high damage/high accuracy attacks should take precedence when we are looking for targets for the ploy. In most cases you won't want to waste Aggressive Defense on a Petitioner's Ancient Weapon attack; save it for an attack more like Guided Greatblade - which is effectively a 4-axe (!) attack in terms of raw accuracy. Beyond these basic ideas about if and when to play Aggressive Defence, there are a few other cards that provide additional benefits when used with it. First, and perhaps most obviously, are models that have inherent counterattacks. While there is no official FAQ ruling on Aggressive Defence at this time, we can assume from prior rulings (like those that allow Twist the Knife and Trap to be played on the same attack) that you could use the attack from Aggressive Defense and an innate counterattack off the same attack action - but generally only if it misses. If you're enamored with the new ploy Haymaker - as some folks seem to be - you might as well double up and use Aggressive Defence on the same fighter. They already can't make defense rolls, and if you played Haymaker on them, it's likely they have a decent attack to swing back with. Finally, there is a significant amount of synergy to be found between Aggressive Defence and Light Armour (damn these British spellings). A model upgraded with Light Armour is likely to get hit by most attacks that target it, so it loses little by forgoing defense. Additionally, Light Armour significantly improves your ability to hit with the counterattack you choose. One final note to keep in mind, Aggressive Defence provides an action outside of the activation sequence, so it can be used on models with charge tokens or those that can't otherwise be activated - this in and of itself may be enough reason to play it. My Turn is often considered to be the standard by which counterattack actions are judged. It's simple, flexible, and effective. How does Aggressive Defence compare to this once-titan ploy? First, it's worth noting that My Turn generally can't be triggered off a missed attack. Aggressive Defence will trigger regardless of the outcome of the initial attack, assuming your model lives through it. Additionally, My Turn doesn't give you immunity to being driven back, instead providing a pre-attack push. In these ways, Aggressive Defence seems like a superior choice. However, My Turn's flexibility pushes it back into the forefront. 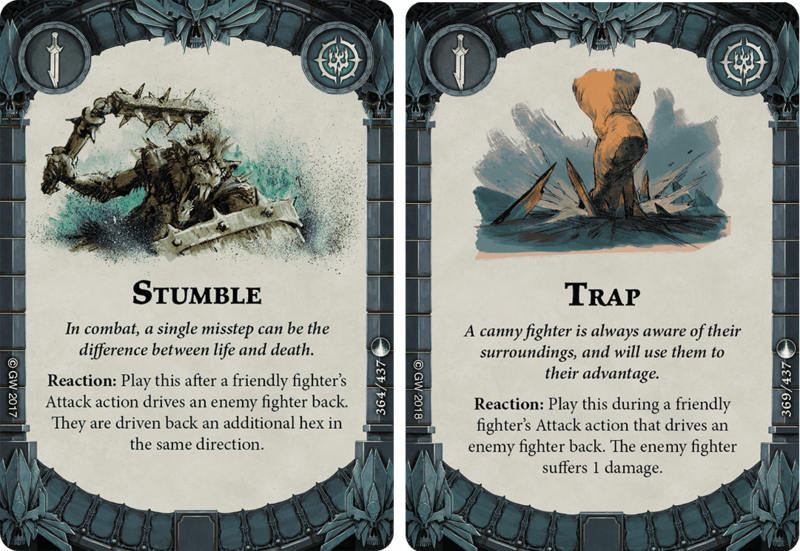 While it provides no immunity to cards like Trap, it does provide additional options in the form of the pre-attack push and a lack of limitations on the target of the attack action your fighter gains. Unlike with Aggressive Defence, a model that is targeted by My Turn could step away from the initial attacker and attempt murder upon a different enemy fighter. Additionally, My Turn can trigger off ploys. This flexibility is well used in combination with cards like Shardgale and Ghoulish Pact, particularly for those tricky Orks. My Turn can even trigger off an enemy's use of Trap after a tied combat result. Finally, since My Turn is played after the result of the attack is known, you'll never accidentally waste it on a model that didn't survive. In the end, My Turn is probably the superior card all around. However, most decks that benefit from My Turn would also benefit from Aggressive Defence. 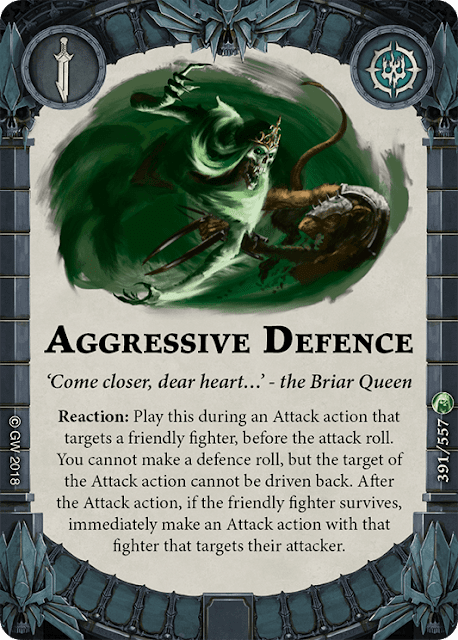 Aggressive Defence is a powerful effect that worth consideration in a number of different decks at this point. It closely mimics the effects of My Turn, once a auto-include in aggressive, high wound decks like Orks and Magore's. 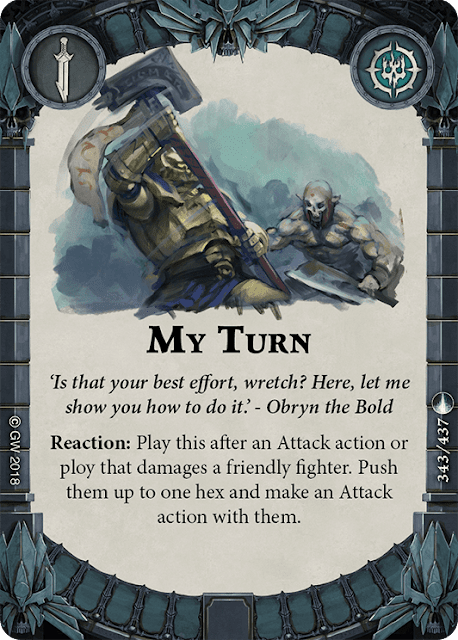 While it doesn't match the raw power and flexibility of My Turn, Aggressive Defence does provide additional defense against ploys that increase damage and against lethal hexes, resulting in a more predictable outcome for the initial attack. 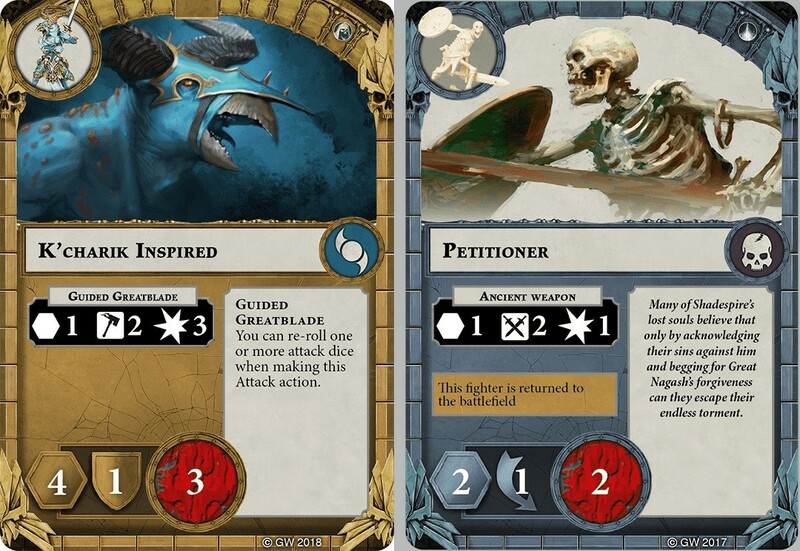 All in all, it's a worth inclusion in many decks, particularly those with high wound counts and low defense stats.